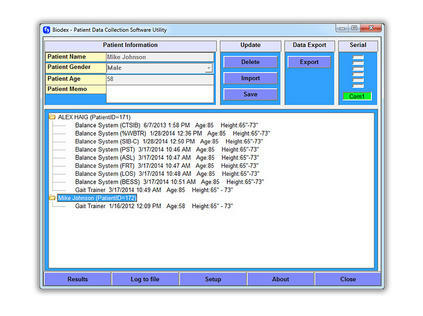 Patient Data Collection Utility Software – Facilitates download and transfer of patient data which allows for unlimited storage capacity. Results can be exported as a .csv file to create normative data. Balance System and Gait Trainer results can be viewed and printed from a compatible computer. The patient test files can be shared between computers. Results can be printed and can also be stored as PDFs using third-party pdf software. The patient data is easily transferred from the Gait Trainer, Balance System or BioSway display via USB flash drive or a serial interface for products with the 12" Win CE displays. Biodex provides this value-added software at no charge. For download instructions and User's Guide, please click the manuals tab above.